Concerts, rehearsals, recording sessions, services, amateur music-making, organ practice and music examinations ensure that St Giles is one of the busiest churches in London. Scarcely a day passes at St Giles Cripplegate without music. Even when the St Giles musicians are out of town, the church is frequently booked for concerts, broadcasts and recordings by visiting musicians. The Barbican Arts Centre, located opposite, the City of London Girls' School next door, the Guildhall School of Music and Drama across the lake, are among those who make regular use of this medieval church, with its glorious acoustics and fine Steinway grand piano, for musical events. The organ was built by Jordan and Bridge in 1733, and then substantially altered and enlarged by Gray and Davison (1844), Father Wills (1863), Henry Jones (1902) and N P Mander (1947, 1970, 1992). Until 1959 the instrument served the "daughter" church - St Luke's Old Street - which was closed as a dangerous structure in December 1959 due to subsidence. Noel Mander carefully dismantled the organ, and it was moved to St Giles and stored there while its future was lengthily discussed. Unfortunately, this was not a second instrument for St Giles: since December 1940, when incendiary bombs destroyed the Renatus Harris organ (rebuilt by Gray and Davison in 1840 and by J W Walker and Sons in 1899), St Giles had had no organ, although the walls and nave arcade of the church survived, a remarkable tribute to medieval engineering. The restoration of St Giles was completed in 1960 - the same year in which a home was suddenly needed for the St Luke's organ. Ten years later, the organ rebuild in a West gallery was completed. The casework is stunning. The original 18th century Jordan and Bridge case, from St Luke's, forms the East front of the organ, with gable-shaped cornices over the upper flats. New casework was designed by Mander's architect, Cecil Brown, for the Choir organ (projected from the front of the gallery) and for the north and south sides. On the West front, the organ speaks into the space under the tower, and this front comes from the 17th century Renatus Harris organ originally at St Andrew's Holborn. 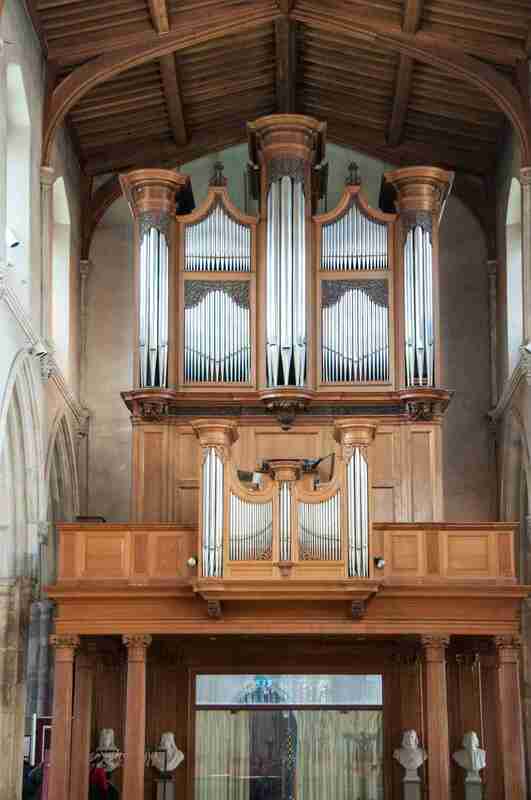 Both visually and aurally, the organ well suits the building and the various demands made upon it. Its first use, of course, is to accompany and lead the divine service. 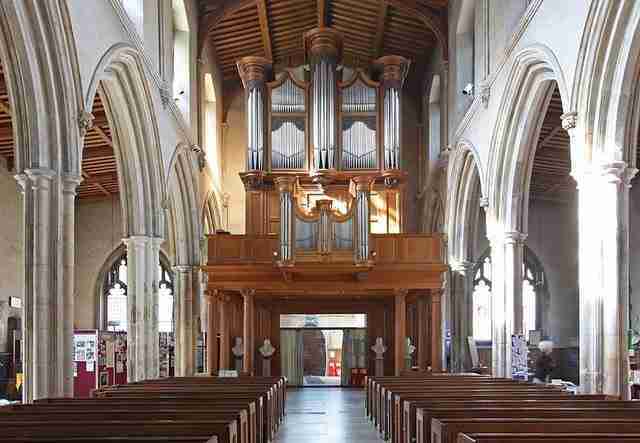 The organ's flue choruses are warm and largely English in style, and the character, lucidity and warmth of the instrument provide an excellent inspiration for worship and support for singing. The organ gallery is just large enough for the choir of four professional and several amateur singers. The instrument's surprising versatility has always been valued. Despite the absence of an Oboe at 8', a Swell 4' Flute and any Celeste rank, it is possible to play almost anything on it. There is no spare room in the Swell box for additional ranks but the quality of the existing Swell ranks solves most problems: the Cornopean is tamed and sweetened by shutting the box, making a reasonable Oboe, and the Tremulants on both Swell and Choir are sufficiently slow and subtle for celestial effects. The Swell organ suffers from its position rather deep in the case, speaking a trifle late against the rest of the instrument. The Swell action is therefore heavier than Great or Choir, although as the Swell to Great is electrically assisted there is no added weight when coupling. The Choir organ, apart from the Father Willis Cremona, is perhaps more North German than English in character, and very beautiful, especially the bright and responsive flutes. These, plus the 4' Principal and the brilliant Cymbal, are all 1970 N P Mander additions, voiced by Ian Bell. The Choir chorus makes an effective foil to the Great which is based on a 16' Double Open Diapason and topped by a choice of Fourniture IV-VI or Mixture III. A glorious Mounted Cornet is available on Great or Choir, as are the famous large Father Willis Trumpet and Clarion reeds. These reeds were given an electro-pneumatic action in 1970, instead of the mechanical action used for the rest of the organ, because of their wind pressure of seven inches. The Pedal department was derived in 1970 from old and new pipework and provides an independent and adequate department; even the Henry Jones Trombone (1902) is not too Romantic for Baroque music. 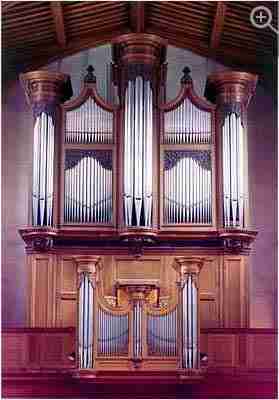 In October 1991, the organ was cleaned and fitted with new solid-state piston actions. There are now 16 memories on department and 16 memories on general pistons, and a sequencer. The sequencer allows the player to select up to 999 general settings and then access them in sequence from a single piston. This imaginative aid provides all the versatility that a player might require, and allows a complex programme to be registered in record time. Unusually, at the request of St Giles, numbers on the stopknobs follow the convention of hotel room numbers: each column begins a new decade (for example Stop 32 means third column, second stop) which helps the registrand to find required stops without delay. 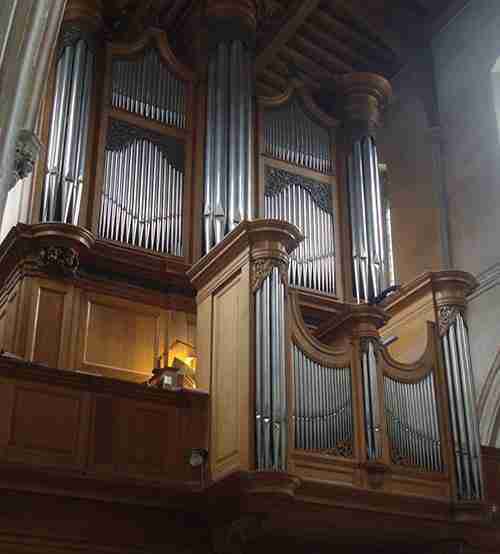 St Giles Cripplegate is the headquarters of the St Giles International Organ School, which provides tuition to over 150 students, so it is important that organ is suitable for players at every level. An adjustable stool, essential for teaching pedal technique, replaced the old organ bench last year. The console, with its unpretentious English stop names (three ranks called Stopt Diapason and not a Lieblich Gedacht in sight), the logical choruses, the obvious character contrasts of the four departments, with each manual built on a different Open Diapason pitch, and most of all the liveliness of the action, promote easy understanding and confident control. Beginners sometimes quail at the weight of the mechanical action, but even this can be very usefully overcome by exercises in relaxation. The Guildhall School of Music and Drama have used St Giles for organ examinations over many years, and the Royal Academy of Music presented Recital Diploma performances at St Giles before St Marylebone organ was complete; and in January 1992 St Giles hosted the Royal College of organists' Fellowship examinations in January 1992. The photograph (above) depicts the restored Bridge case, the new Choir organ case projecting from the gallery. At the rear, facing west, is a fine case which incorporates some carving from the Renatus Harris organ which at one time stood in St Andrew's Holborn. The rest of the casework, the gallery and much of the pipework is new. St Giles welcomes visiting parties of organists whenever possible.